This social protest film is Charlie Chaplin's final stand against the synchronized sound film - and it is also his last full-length "silent film" - although it must be noted that it is a quasi-silent film. There is no traditional, synchronized voice dialogue in the film - but voices and sounds do emanate from machines (e.g., the feeding machine), television screens (i.e., the Big Brother screen - pre-dating George Orwell's book 1984, written/published in 1949), and Chaplin's actual voice is heard singing an imaginary, nonsense song of gibberish. Special sound effects and an original musical score (by composer Chaplin, including various musical themes from "Hallelujah, I'm a Bum," "Prisoner's Song," "How Dry I Am," and "In the Evening By the Moonlight") enhance the pantomime. Set in the 1930s during the Great Depression era, the film's main concerns (and those of the oppressed Tramp) echo those of millions of people at the time - unemployment, poverty, and hunger. It has a number of wonderfully inventive and memorable routines and scenes that proclaim the frustrating struggle by proletarian man against the dehumanizing effects of the machine in the Industrial Age (at the time of Henry Ford's assembly line), and various social institutions. The scenes of the Tramp find him alternating between scenes as an assembly-line factory worker (where he is literally fed by a machine and then - when the monotony overtakes him - becomes the 'food' in the cogs and gears of another machine), a shipyard worker, a department store night watchman, an overstressed singing waiter, or an occupant in jail. The Tramp also finds himself dealing with various authority figures during his exploits: a 'Big Brother' factory boss, a minister, juvenile child-care authorities, a sheriff, a shipyard foreman, a department store manager, etc. Its premiere in New York City was held in early February, 1936 at the Rivoli Theatre. Chaplin did not attend the premiere of his first film in five years because during his previous public appearance in New York, he found himself "battling through the crowds" everywhere he went. He dreaded the thought of "being stared and pointed at as though I were a freak." A second premiere was held a week later in London, and then a third premiere - a "glamorous" event held in Hollywood (at Grauman's Chinese Theatre) where both Paulette Goddard and Chaplin were in attendance. Under the superimposed credits, a clock face approaches 6 o'clock. 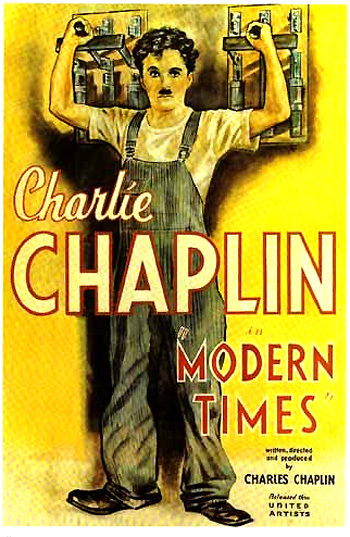 The foreword explains the film's theme: "'Modern Times.' A story of industry, of individual enterprise - humanity crusading in the pursuit of happiness." The film opens with an overhead shot of a flock of sheep jostling in their sheep pen, and rushing through a chute. Instantly, the sheep dissolve into a similar overhead shot of industrial workers pushing out of a subway station at rush hour on their way to work in a factory. In an upper executive office level of a steelworks factory, the Electro Steel Corp., a "Big Brother" manager/President (Allan Garcia) works on a boring puzzle, reads the comics in the newspaper, and is served by his secretary. He switches on a two-way TV screen with on-line audio and video transmission (when practical TV was only a dream) where he can view all parts of the plant operation. He orders one of his foremen, in the first synchronized speech in the film to hurry production on the line: "Section 5 - speed 'er up - 41." During a short break, he cannot stop the jerky, rhythmic movements of his nut-tightening - the trauma of work has left him with a nervous tick. A "Big Brother" screen of his employer in the men's room reprimands him when he sneaks a cigarette: "Hey, quit stalling. Get back to work. Go on." a practical device which automatically feeds your men while at work. Don't stop for lunch. Be ahead of your competitor. The Billows feeding machine will eliminate the lunch hour, increase your production, and decrease your overhead. The device is a mechanical, automated, aerodynamically-styled, silent feeding machine which features a revolving table, an automaton soup plate, an automatic food pusher, a revolving low and high gear corncob feeder, and a hydro-compressed sterilized mouth wipe. At lunch time, the break is sounded and the line stops, but the Tramp is so programmed that he starts tightening buttons on a woman's bottom. And he cannot control jerky arm movements that cause him to spill his co-worker's soup. He is chosen as a guinea pig to test and demonstrate the feeding device. Naturally, the mechanized meal machine shorts out and goes haywire - making the food inedible in an unforgettable scene. The spinning corn cob server goes wild, the soup is tipped and dumped down his front and hurled in his face, metal bolts are shoved into his mouth instead of food, a dessert shortcake is forced into his face, and the mouth wipe repeatedly pummels him in the mouth. The President is unhappy with the demonstration: "It's no good - it isn't practical." Back at the job in the late afternoon after his disastrous, nightmarish lunch, he rejoins his co-workers on the assembly line. The boss has ordered production increases: "Section 5 - give 'em the limit," so the conveyor belt is sped up - a hilarious, frenzied scene as the Tramp makes an heroic effort to keep up. Under the strain of the job, he finally goes beserk, slowly driven insane and engulfed by the assembly line. He literally lies prone on the belt and is dragged, swallowed and eaten up by the whizzing wheels, gears, and cogs of the monstrous machine. His body snakes its way through the gears until the production line's direction is reversed and he finally emerges free of the machine. He has gone completely crazy and insane. In a trance-like state, with wrenches aloft, he demonically tightens everything in sight, including people's noses. With arms aflutter, he dances a beautiful but mad ballet. He chases the woman with the buttons on her bottom through the factory to the outdoors. There, he eagerly pursues a large-breasted woman with two buttons on her front. Back in the factory's control room, he pulls all the levers and switches in sight, causing explosions in the equipment. He continues his mad ballet with an oil can. He is hustled off in a car by a white-coated attendant, to be treated in a psychiatric ward for a nervous breakdown - he has become a "nut" himself. "Cured of a nervous breakdown but without a job, he leaves the hospital to start life anew." The doctor offers some last-minute advice: "Take it easy and avoid excitement." The Tramp, now wearing his familiar outfit, joins a large number of people who are unemployed, since the economy is depressed, and factories are closed. On the street, he obligingly picks up and waves a red warning flag that has fallen off a passing construction truck. Again, his small personal action has greater consequences than expected - he is mistaken for the rally leader of a flag-waving demonstration of Communist agitators who have just rounded the corner behind him. In the comedy of errors, he is promptly arrested by club-wielding police and hauled off to jail in a police patrol wagon.